UPND president Hakainde Hichilema and Dr Nevers Mumba should allow President-elect Edgar Lungu to govern the country following the ruling by the Constitutional Court to dismiss the presidential petition, says Patriotic Front Kabushi Member of Parliament Bowman Lusambo. In a statement to the Daily Nation yesterday, Mr Lusambo said Mr Hichilema and the MMD faction leader needed to respect the will of Zambians who re-elected Mr Lungu in last month’s general election and allow him to govern and accord him the respect due to him. He said the conduct of the two opposition leaders left much to be desired and warned that anyone who undermined the Constitution was equally undermining the citizens. Mr Lusambo said that the tone of the purported open letter Dr Mumba wrote to President Lungu demonstrated his dislike, jealousy and lack of respect for the Presidency. He said that Mr Hichilema and the UPND party were rejected by the majority of Zambian who re-elected Mr Lungu and that it was important that this choice was respected. “The conduct of the two leaders in the aftermath of the elections leaves much to be desired. My earnest appeal is to Dr Mumba and his team in the UPND to respect the choice that Zambians have made to continue with the proven leadership of President Lungu. ‘‘The tone and style of Dr Mumba’s letter to President Lungu confirms that the man is playing with the presidency and I believe that anyone who plays with the Constitution of the Republic is playing with the people of Zambia. ‘‘Mr Hichilema and his UPND were rejected by the majority of Zambians who voted on the 11th of August and it is important that this choice is respected. 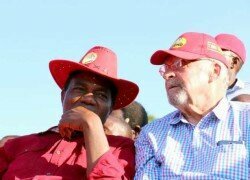 The Zambians themselves saw through the hearts of the UPND leadership and knew that the people were not sincere and genuine,” he said. Mr Lusambo accused Mr Hichilema and Dr Mumba of not having any political acumen but that they had only chanced leadership in the UPND and MMD respectively.